It was inspired by a farcical concert, it got up and running thanks to a whip round in a living room, and was sustained by much perspiration from its members during economically depressed times. From such inauspicious beginnings, a great success story grew and this year Music for Galway is celebrating its 30th birthday and three decades of successfully bringing the very best classical musicians to Galway to play the greatest classical music for the people. Music for Galway held its 30th Anniversary Fundraising Gala Reception and Concert in the Town Hall Theatre. 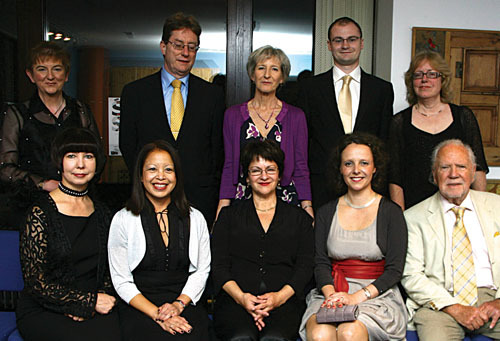 The night saw performances from the Metropolitan Opera baritone Rodion Pogossov and soprano Evelina Dobraceva, accompanied by pianist Dearbhla Collins; a charity auction; and honours conferred on Music for Galway founder member Erika Casey, as well as to NUI, Galway, for its support to the organisation. Erika Casey is originally from Rheinhessen, the wine region of southwest Germany and it was in her native land that she grew to love classical music. “Music is part of my life since childhood,” she tells me as we sit in the Galway City Museum café for the interview. “I had two friends who studied piano and when I went over to their house to play with them I had to wait until they had finished their practice. Erika came to Ireland in 1956 and since 1967 she has lived in Galway. Her husband was the late Tim Casey, who was professor of German in UCG/NUI, Galway for many years. Her love of classical music continued and eventually led to the formation of Music for Galway. This was in 1980. Ireland was still recovering from the industrial unrest of the late 1970s, and just around the corner lay the GUBU government, the hunger strikes, and the economic mess that saw thousands emigrate. It was not a time of hope and prosperity, and yet, as Ireland has the misfortune to enter another such era, the success of Music For Galway, born along by enthusiasm, commitment, hard work, and public goodwill perhaps contains a lesson for surviving and thriving in tough times. Erika, Jane, and some friends and interested parties got together in Erika’s sitting room to plan on founding an organisation to replace the old piano in UCG and ensure quality classical music concerts for the city. “At that meeting was Angela O’Keeffe, who became our first chair, Tony Broadrick, Gerry Lee, and the university was welcoming of our idea to buy a grand piano,” Erika says. “We decided to get a Steinway built in Hamburg as any musician I had asked had always said this is the piano they liked to play. The fledgling group decided to hold a public meeting in The Salthill Hotel to see what kind of interest, support, and ideas there was for a classical music concert organising body and supporting buying a new piano. It did the trick. The new group could not believe the numbers that turned out at the meeting in Salthill, all showing great enthusiasm for the idea. John O’Conor’s performance was followed by a sell out concert from the Ulster Orchestra, conducted by Bryden Thomson, in Seapoint. Music For Galway had arrived. Thirty years on and MFG is still going strong. It too faces the challenge of the current economic crisis but audiences are still showing great support and MFG remains determined to bring the best music and musicians to the city. Music For Galway’s executive officer Anna Lardi Fogarty says much of the group’s success is down to its volunteers. This year’s programme of events has plenty of highlights such as the Rosamunde Trio on November 4 in the Aula Maxima; the Amongst Friends festival in January, featuring pianist Barry Douglas, cellist Eugen Mantu, and ConTempo; The Danish String Quartet in February; the RTÉ National Symphony Orchestra performing Mozart piano concertos in March. Erika and Anna are naturally looking forward to all of these shows, but one show in particular is really exciting them: the RTÉ Vanburgh String Quartet performing Beethoven’s late quartets in February. “These quartets are amazing,” says Anna. “One of them builds to a great fugue at the end and it sounds almost like a contemporary piece. People didn’t understand them at the time, but Beethoven said these quartets “were not written for my contemporaries, but for future generations”. Tickets for all other Music For Galway concerts are available from Music For Galway (091 - 705962 ); the Town Hall Theatre (091 - 569777, www.tht.ie ), or Opus II, The Cornstore, Middle Street.